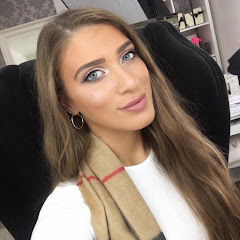 My name is India-Robyn and i'm from the 'The Jewel Beauty' I'm so happy to be doing a guest post for the lovely Sophia, and i hope you all enjoy it. Blogging is such a great way of making new friends, and now me and sophia talk most days! My post is going to be about my current favorites, and i have hand selected two items from each category. I'm really loving my Sanctuary Body Butter, it's far from greasy and it moisturises very well, and for such a lovely product its a great price! 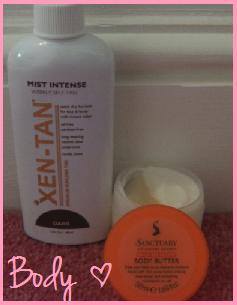 I also love my Xen Tan Mist Intense, It's my favorite brand and because i used to love professional spray tands, i use the spray version over the lotion version. I forgot to mention that both of these products smell lovely, and the tan definitely does not have a strong biscuit smell. 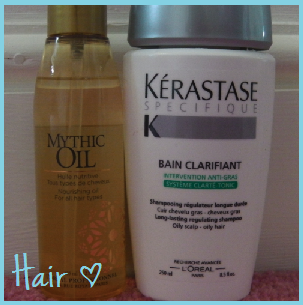 Mythic Oil is a really lovely smelling light weight oil, which also speeds up blow drying time. I love the way it calms any frizz, and how it doesn't make my slightly oily scalp greasy. I started using Kerastase because my hair can get quite oily, this shampoo is the ultimate detox and removes any build up products. I only use this product now and then, because it's very powerful. However, it works amazingly and i would recommend it for anyone with troublesome hair! Okay, so i cheated a little bit on this one, as i have three favorites. The first being my sample of the Origins Gin-Zing Eye Cream. I'm really getting along with the eye cream, it's not greasy at all which is a bonus. I hate watery eye creams, as my concealer always slides on top of them. The next product is my Skin Truffle Cream by Temple Spa, i honestly think this is the most amazing product i have ever tried. It's made out of diamonds, truffles & gold dust, and it's cheaper compared to Chanel's £200.00 version. The final product is my Grape Fruit wash, i really like this and it's a bonus that it helps reduce breaking out. I do notice it has slightly drying effects on my skin, but nothing a good moisturiser won't sort out. 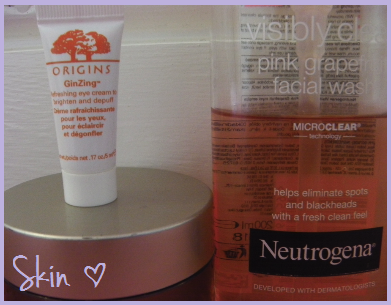 I love using drug store skin care, and Neutrogena is one of my favorites. Firstly, i'm on the third bottle of this foundation. It's very light weight, but it has the ability to be build-able which i like. The next product is the new and very hyped Revlon Lip Butter, i have heard some people don't like the glitter in #Peach Parfait, but i don't mind a bit of glitter personally. 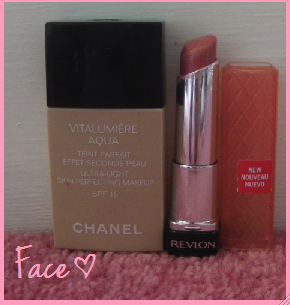 I mix it with a dabble of concealer to make it s little but lighter, as it's more of a red based peach than a beige. It looks great on, and i feel like it adds warmth to my complexion. I would like to say a huge thank you to India for taking the time to write up an amazing guest post! Like i said before please stop by her blog and don't forget to check out her luxurious lip balms!